This recipe puts a spin on traditional pecan pie, making it healthier, and still just as delicious. The sweet potatoes and dates bind the rest of the ingredients together to really lock in all the flavors. We’ve done our best to create this dessert using whole, healthy ingredients, but keep in mind that it’s still an indulgent treat meant to be consumed on special occasions. Pro tip: If you’re trying to stay on track with a healthy diet, this is the type of pie you should enjoy once or twice a week at most – and even then at the recommended serving size! 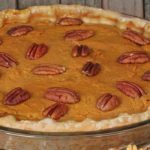 This Sweet Potato Pie is a healthier spin on a traditional pecan dessert and features Medjool dates, raw pecans, and pure maple syrup. Combine oats, flour, almonds, 1 Tbsp. maple syrup, and ¼ tsp. salt in a medium mixing bowl; mix well. Add 3 Tbsp. oil to oat mixture; mix well. If needed, add water to hold mixture together. Press into a 9-inch pie pan. Bake for 8 to 10 minutes, or until light brown. Place 1 cup pecans in a food processor; pulse until well ground. Add dates, remaining ¼ cup maple syrup, remaining ¼ tsp. salt, remaining ¼ cup oil, egg white, sweet potato, and ginger; pulse until well blended. Pour pecan mixture into cooled crust. Top with remaining ½ cup pecan halves. Bake for 20 to 22 minutes, or until firm. Serve warm, or cool pie on wire rack. • This pie is extremely rich, so a serving size is small than a regular slice of pie. • For a vegan version, eliminate egg white. This pie will be denser, so it's best served warm or cold (out of the refrigerator).